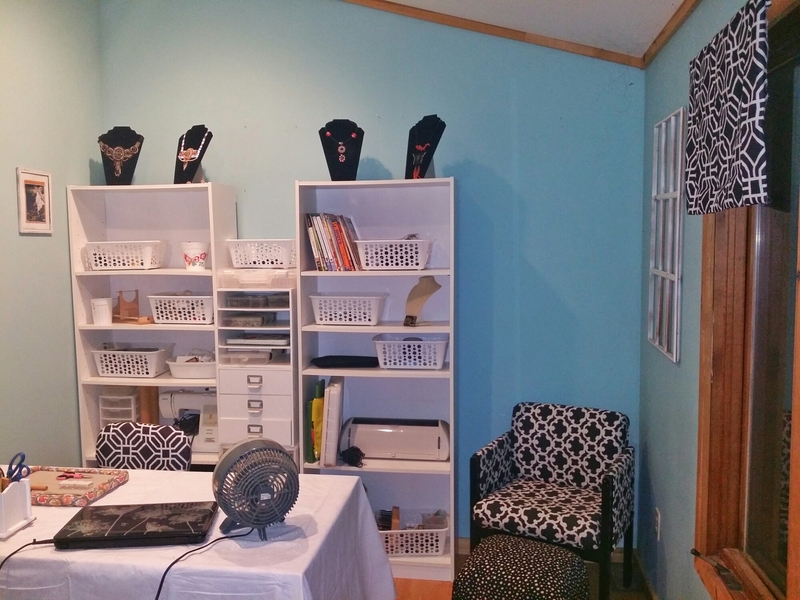 Finally took the time to purge my craft room and focus it on beads. For years I’ve tried my hand at a lot of creative endeavors but now feel like I have found my niche in beadwork. So…time to consolidate and get rid of some old hobbies. I love working with metal but I just don’t have a well ventilated space so for now I’ve packed up my torches. It was also important to me to create a space for my daughter to paint. 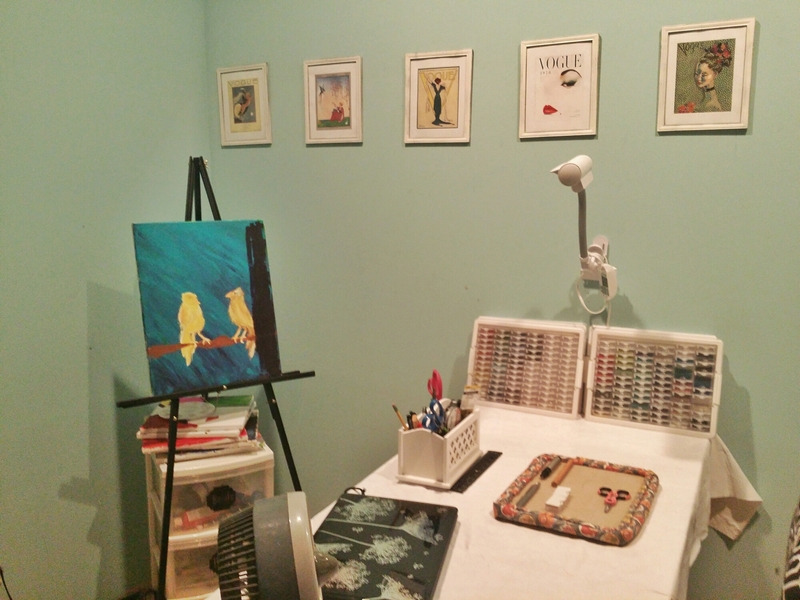 We cleared out a corner for her easel and I look forward to some fun, creative girls nights in what we are calling our “studio” which makes us feel way more serious than if we were creating in a craft room. So finally, Lusk Studio actually has a studio of sorts. Of course if you know me, you know I went thrifty. I found a body pillow cover for $2.50 that I made the valance and recovered the rolling office chair with. The arm chair I stole from my office and had previously recovered. I made the Ottoman out of a crate with a pillow on top that I then covered in fabric. It’s not crazy sturdy, but it’s fine as a footstool. I got all of the storage containers at the dollar store (except bead containers – those are the Elizabeth Ward organizers). Then to decorate, I found some vintage Vogue covers from the early 20th century and had UPS print them on glossy paper. I framed them in painted, distressed dollar store frames. Of course I already had the bookshelves and desk so really it was a cheap makeover. I think I spent under $20 total! 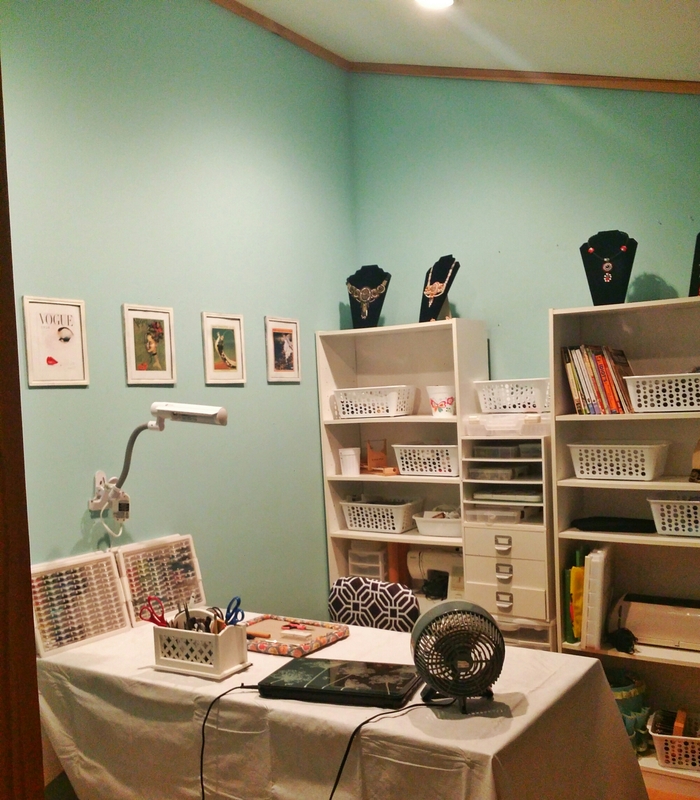 Anyway, I love seeing other people’s craft rooms so thought I’d share ours.